Rabbi Yisroel Perelson is a certified New York Mohel, a rabbi who is specially trained to perform the circumcision ceremony. He received his degree in advanced training in Circumcision/Milah Skills from Moreshet Avot under the tutelage of the prominent and respected Mohel and trainer, Rabbi Azran. The training consists of a thorough study of the anatomy, sterile surgical procedure, and religious laws and customs. All of Rabbi Perelson’s state of the art instruments are autoclaved and meet the highest Standards of sterility. Rabbi Yisroel Perelson is a very sought after, respected and popular Mohel in the Tri-state area. 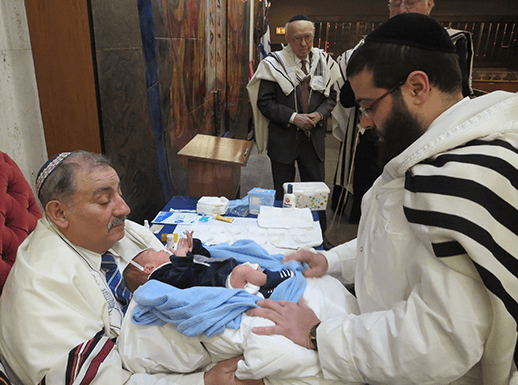 Rabbi Yisroel Perelson performs Bris ceremonies in Synagogues and private homes throughout New York and New Jersey. He is also available to travel beyond those areas. His warm, cheerful, upbeat persona, in addition to his uncompromised service of excellence, has attributed to his enormously lengthy roster of confident highly satisfied parents. As a professional New York Mohel, Rabbi Yisroel Perelson combines safe and competent surgical procedure with a meaningful and relevant religious service. He is enthusiastically recommended by rabbis, physicians, and satisfied parents. References are available upon request. Rabbi Yisroel Perelson is an expert at minimizing pain to the baby and the entire procedure takes less than 10 seconds. Many who have observed his technique have marveled at his skilled precision and gentle touch. Rabbi Yisroel Perelson uses the most modern medical advancements for a Bris procedure. As a result, the healing process is twice as fast, which ensures a more pleasant process for both the baby and the parents. Rabbi Perelson combines his expert skills with a fatherly touch. He is the father of a large family and he treats each baby as his own. You will feel confident that your baby is in accomplished and experienced hands with Rabbi Perelson as your family NY mohel. Families who worked with Rabbi Perelson once, keep coming back to him with their new baby boys.